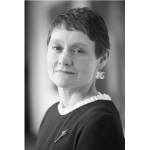 Helen Higson has worked in Higher Education since 1983. She is currently Provost and Deputy Vice-Chancellor for Aston University where she is Chief Academic Officer. Her previous role was as Head of Learning and Teaching at Aston Business School. Helen is Professor of Higher Education Learning and Management and National Teaching Fellow (NTF) and Principal Fellow of the Higher Education Academy (PFHEA). Her current research includes intercultural training for staff and students and research into employability competencies and diversity. She contributed a chapter to the 2012 Wilson Review on University Business relations. Helen is a Trustee for Ikon Gallery, Birmingham and on the Board of Governors for Ravensbourne College, London. She is a member of Culture Central Group and a member of Cultural Education Partnership. She was Vice Chair of Governors at Joseph Chamberlain Sixth Form College and a Trustee for Ex-Cathedra Choir from 2009-2016. Helen was awarded the OBE in the 2011 New Year Honours for services to Higher Education.